Budapest tram lines are epic, do not miss the spectacular views from a yellow tram if you visit Budapest. Trams are inexpensive ways to get around the city and they offer fast and reliable transportation. With the Budapest Card, public transport is free (trams, buses, underground). It is a clever way to get around in Budapest and enjoy free entries and discounts on the tourist’s attractions. Tram 2 is one of the ten most beautiful tram lines in the world, which runs along the river Danube on the Pest, to the centre of Budapest. We can see the castle hill and Buda Castle on the opposite side throughout the whole ride. The tram starts at Kozvagohid and runs on its beautiful way along Budapest. From here we can reach the Palace of Arts, which offers a lot of great Concerts in Budapest, and the Hungarian National Theater. The line also touches the Pest side of the Elisabeth Bridge. From here, we can easily reach some of the Budapest River Cruises. the Advent weeks. 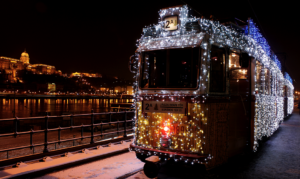 Enjoy the spectacular festive lights of Budapest and the tram. Close to the Great Market Hall, we can find the chic green Liberty Bridge which is probably the most stylish bridge of Budapest. The next stop will be the Eotvos square and from there the Chain Bridge is visible. Chain Bridge was the very first permanent bridge build over the Danube in Budapest and it is a symbol of the Hungarian Capital. If we continue the ride, we get to Szechenyi Istvan square, then to Kossuth Lajos where we can stop to visit the Holocaust memorial, Shoes Along the River Danube. This stop is also close to the Parliament, you can take a tour to get to know this amazing architecture and enjoy a boat ride with a drink afterwards. The last stop will be on the north, Jaszai Mari square, close the Margaret Island and Margaret Bridge. Margaret Island is a historical island with ruins and green parks, running track, mini zoo etc.